White interior soft box designed for strobe lights. Great for full-length and group portraiture. Highly recommended for product and still life photography. Size is 16 x 22 inches. This Photoflex Small LiteDome Kit is for Shoe Mount Flashes. It enables you to use any shoe mount flash (except Sony, or Konica-Minolta) off-camera, with a softbox. 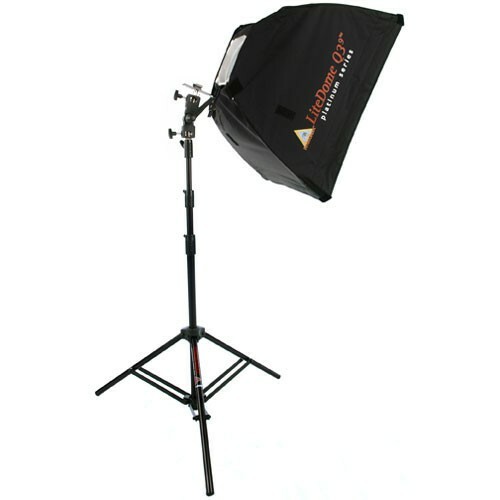 The included light stand rises to a maximum height of 7.8 feet. The Photoflex 16x22" softbox is ultra portable and lightweight. It can be taken on location easily. The softbox comes standard with a recessed, removable front diffuser. An optional fabric grid is available for more light control. Softens the light from your shoe-mount flash for more pleasing portraits. Suggested Uses: one - three Person headshot main light, two - three person hairlight.